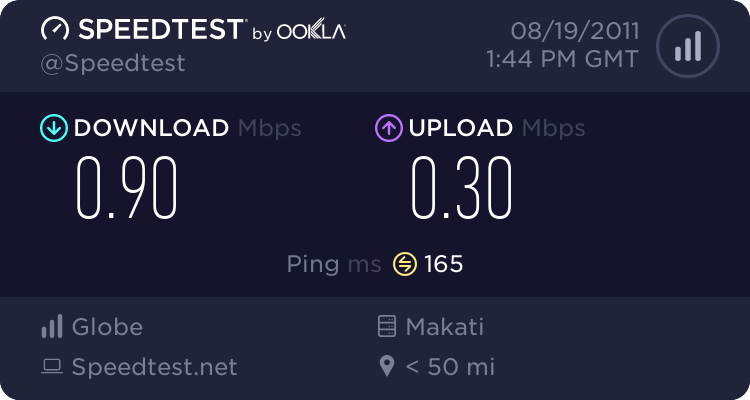 The image at the left shows the connection speed of my wired broadband connection based on a test I did just before I start writing this article last night at around 10:00 PM in Marikina City, Metro-Manila. I am subscribed to 1Mbps residential plan that costs PhP995.00 per month and based on the download speed result I got, my Internet service provider (ISP) is compliant to the new memorandum circular on minimum broadband speed issued recently by the National Telecommunications Commission (NTC). Broadband service providers shall specify the minimum broadband/ internet connection speed and service reliability and the service rates in their offers to consumers/ subscribers/ users in their advertisements, flyers, brochures and service agreements and service level agreements. The minimum service reliability shall be 80%. In the press release, NTC said it issued the circular to correct the practice of service providers who are specifying only the maximum speed in their broadband offerings. The agency also said a minimum speed was necessary since various broadband wireless technologies differ in transmission characteristics, with mobile Internet access being the most vulnerable in signal fading more than fixed and fixed wireless Internet access. The NTC order provides that failure on the part of a broadband service provider to comply is a ground for the filing of an administrative case. Rule No. 6 of the memorandum order dated July 15, 2011 states: “This Order shall take effect fifteen (15) days after publication in a newspaper of general circulation and three (3) certified true copies are furnished the UP Law Center.” so the minimum 80% of the broadband speed promised by our ISPs should be in effect by now. Is your ISP already complying to NTC M.O. No. 07-07-2011? By the way, I am a bit late in blogging about this circular mandating the minimum broadband speed because when I read about it in the news last July 18th, I immediately looked for a copy of the order but a check on NTC website turned negative and up to the time of posting this article, the agency has not published it there. I only found a copy of the order recently at The ProPinoy Project and I am not sure if NTC has already complied with its own Rule No. 6 on publishing the circular in a newspaper of general circulation. Also, I want to add that I was getting the connection speed shown in the image above even before NTC issued the order on minimum broadband speed. I wonder how many among us are lucky enough to get 80% of the connection speed promised by our ISPs. YES ! ! ! we need this NTC Circular very much. This has long been overdue.